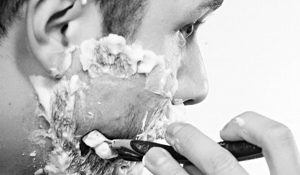 The 5 Most Common Shaving Mistakes | Valet. Most men have been shaving a few times each week since puberty. Which results in plenty of practice at dragging that sharp blade across their face. But that doesn't mean they've gotten any better at it. And couldn't we all use some improvement? It starts with choosing the right tools. In a blind study, an independent research company asked a few hundred men to compare razor blades. Not only were Gillette razors rated higher overall, but men also found Gillette blades to be smoother and more comfortable than the others. Herewith, five other ways to improve your daily shave and prevent the most common blunders made at the bathroom sink. If you're just turning on the tap and wetting your face with a splash of cold water, you're doing yourself a disservice. You want to open up your pores and relax the hair follicles, and the best way to do that is with steam or a hot towel applied to the face. The next best thing? Simply washing your face with warm water, which will soften the stubble and make it easier to cut. Shaving after a shower is the ideal time. Depending on the quality of your razor, your blades may be filling with a sediment of hair, dead skin and shaving cream with each stoke. It can easily build up and reduce the sharpness and glide of your blades, resulting in a spotty shave along with nicks and razor burn. So be sure to thoroughly rinse your blade after each pass. Less is more when it comes to shaving. Pressing the razor hard against your skin will create an uneven surface. You won't achieve the right angle to properly cut the hair and also run the risk of digging into or cutting the skin. Use a light touch and let the razor do the work. 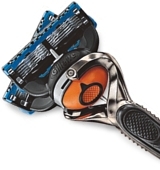 If you feel like you need to press harder to cut the hair, you likely have a dull blade that is in need of replacing. Nothing ruins that clean, freshly-shaved look quite like unkempt tufts of hair on your neck. Make sure when you're shaving under your chin that you continue down your neck and past your Adam's apple. Ideally, there should be no hair north of your collar. Sign up for free and choose a convenient plan (for as low as $3.40 per cartridge) that will keep you stocked with quality blades. Plus, members get exclusive rewards and perks like free products and major league sporting and entertainment tickets. It was likely one of the warnings you got from your father when you started shaving: don't go against the grain. 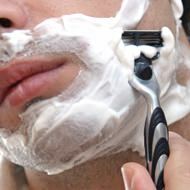 But many men, looking to get the smoothest shave possible, flip that razor upside down and sweep it back over the areas they've just shaved. And it's almost a guaranteed path to irritation, red bumps and painful ingrown hairs. If you need to go over an area again, wait until you're done shaving your whole face and then go back over the area in the direction of the hair growth. Think you need to shave in the morning? How to stop a shaving cut from bleeding.